Written By: Ross W. Greene, Ph.D. Here, Dr. Ross W. Greene presents an enlightened, clear-cut, and practical alternative. 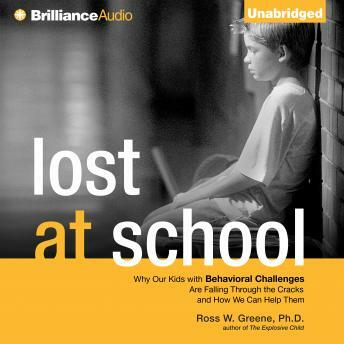 Relying on research from the neurosciences, Dr. Greene offers a new conceptual framework for understanding the difficulties of kids with behavioral challenges and explains why traditional discipline isn't effective at addressing these difficulties. Emphasizing the revolutionarily simple and positive notion that kids do well if they can, he persuasively argues that kids with behavioral challenges are not attention-seeking, manipulative, limit-testing, coercive, or unmotivated, but that they lack the skills to behave adaptively. In Lost at School, Dr. Greene describes how his road-tested, evidence-based approach-called Collaborative & Proactive Solutions-can help challenging kids at school. - tools to identify the triggers and lagging skills underlying challenging behavior. - explicit guidance on how to radically improve interactions with challenging kids-along with many examples showing how it's done. - dialogues, Q & A's, and the story, which runs through the book, of one child and his teachers, parents, and school. - practical guidance for successful planning and collaboration among teachers, parents, administrations, and kids. A very good insight of early childhood when it is the prime time to learn the important skills they need to succeed later in life. Skills to cooperate, discuss and solve functional and social problems have so much impact on learning academics and other life skills in the continuing education. Wonderful read, awesome resource for teachers and parents!